New to the team, freshmen Sean Horvath and Brice Samples hit the ground running with immediate contributions. 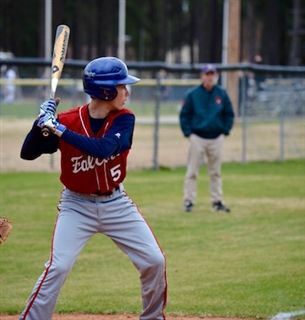 Third baseman, Brice Samples managed to score once with RBI’s for all three plate appearances. Making his debut as catcher, Sean Horvath did an outstanding job behind the plate as well as scoring twice with two RBIs in addition to a steal to second base. Juniors Josh Pleasant, Will Taylor, Tucker Fessenden and sophomore Lyle Summers also made solid hits, RBIs and scores. On the mound, with support from his team, junior Will Taylor managed a no-hitter game with 11 strike-outs. O’Neal plays at Fayetteville Christian on Monday, March 21st. Will Taylor and Joseph Tozzi (Pictured) live in Lee County.